This entry was posted in Uncategorized on September 21, 2018 by Helen. Joking Apart by Alan Ayckbourn was a great success and a sell out Friday evening. Many thanks to all who came, we hope you enjoyed the show. 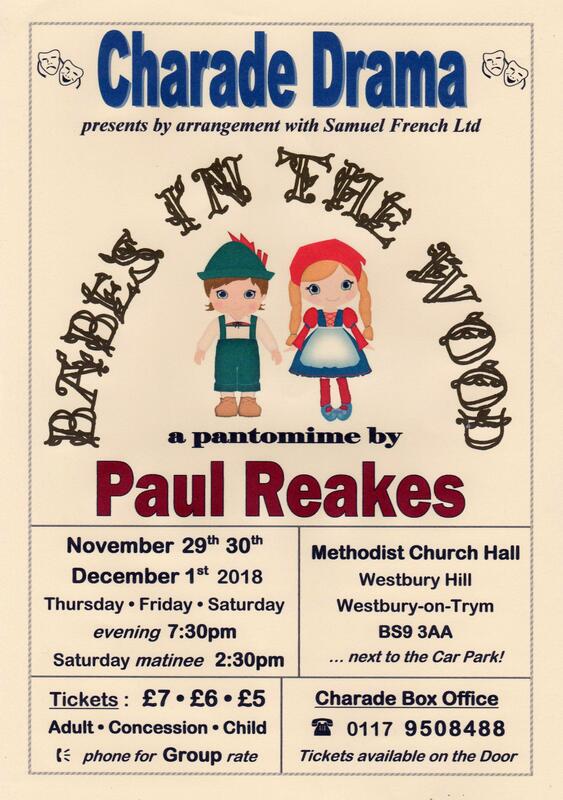 Our next production will be a Pantomime, November 29th, 30th and December 1st. So save those dates and await more information. This entry was posted in Uncategorized on May 8, 2018 by Helen. Alan Ayckbourn considered “Joking Apart” to be his favourite play. It is a mixture of comedic and painful moments in true Ayckbourn style. It follows the life of “golden couple” Richard & Anthea, and the effect their happy and successful life has on friends and neighbours over a period of 12 years. Please do come and enjoy it with us. This entry was posted in Uncategorized on January 18, 2018 by Helen. Our November production of 3 one act plays was successful, (please see Past Productions for photos) Just about everyone had a part. Next dates for your diaries is April 19th – 21st. Play yet to be decided, we’ll let you know when we do! This entry was posted in Uncategorized on October 23, 2017 by Helen. We have finished our Spring production and now looking forward to reading possible plays through the summer, ready for November. Dates are Thurs 23rd – Sat 25th November 2017. If you are interested in joining us please see the Contacts page and get in touch. For photos of our recent productions go to Past Productions. We look forward to seeing you at our next production. This entry was posted in Uncategorized on April 3, 2017 by Helen. We are pleased to announce that the Spring Production for 2017 is to be a comedy. ‘No Time for Fig Leaves’, by Duncan Greenwood and Robert King, will run from Thursday 30th March to Saturday 1st April, beginning at 7.30 pm in the Westbury on Trym Methodist Church Hall. Please click on the flyer for further details and ticket prices. This entry was posted in Uncategorized on February 26, 2017 by Helen. Trouble in Pantoland has been lots of fun! Between 24th and 26th November, we have put on four performances of ‘Trouble in Pantoland’. It has all been great fun, with each of the evening and Saturday sessions well attended and received. If you’d like to see a set of photos taken at the dress rehearsal, then please see our ‘Past Productions’ page. This entry was posted in Uncategorized on December 3, 2016 by Helen. 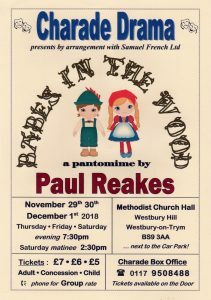 Our next production will be a Pantomime, we don’t yet know which, but we do know the dates. There are going to be plenty of roles both on and off stage, so do get in touch if you would like to be involved and save those dates in your diaries. This entry was posted in Uncategorized on May 2, 2016 by Helen.